By now you probably realize that there is a company in China with a factory where most of the electronics in the world are manufactured. If you own an HP, Dell, Apple, or Sony desktop or laptop; if you own an iPhone or Android phone or Blackberry; or if you own a sound system, it was probably made in the Chinese FoxConn factory. Working conditions there are poor. However, FoxConn is a heavenly paradise by comparison with some garment manufacturing facilities in Third World countries. A recent 9-story building collapse in Dhaka, Bangladesh has resulted in a death toll of 400 and still counting. Apparently, several different garment contractors used the building to run sweatshops. The owner of the building was caught fleeing Bangladesh to India (which likely would have handed him back to Bangladesh anyway, had he been caught there). To be sure, the building owner will get a lot of blame for operating a building that was, well, collapsible. But how much did he know? Was the construction company at fault for not following architect plans to the letter, or were their raw materials suppliers at fault for delivering substandard building materials. What about the architects? : did they cut corners in design to keep costs down (and in a poor country like Bangladesh, costs are always a consideration)? Then, going in the other direction, how much blame should be laid on the doorstep of companies like Walmart, Sears, Target and others who, even if their products weren't manufactured in this specific building, contract to have products manufactured in similarly unsafe circumstances? Do American companies have a responsibility to workers working under contract in other countries? or is this the business of the people and governments there? Regrettably, the majority of us care only about that which personally affects us. Or someone else's confident-sounding talking points. It's just institutionalized oppression. And the American way is if it doesn't bother us, if don't see it with our eyes, if it doesn't directly affect us, then we don't care and we don't want to hear about it. As a Secular Humanitarian Atheist, I would say its all our fault (everyone in the world). We let oppression happen everywhere, we even contribute to it, but we are so naturally caught up in our lives and problems, that we become selfish to everything else and we start not care about the world. But that's the thing though. If we can get more people involved in Humanitarian ideologies as a whole, we can begin to fight these injustices. However that is very hard, we humans barely agree with each other, let alone coming together as a world force and battling any type of oppression. I guess as they say, if you want to change the world, you have to first change yourself. In the end. that's all you can do huh? In terms of changing the world, I see this differently. We don't even have enough humanitarianism at home. The number of homeless is still going up, people are still dying terrible deaths here every day from cancer and other diseases, and we still need to convert over to greener energies. If we can work on all those first, we can improve the state of the whole world just by using our strengths in sciences and technologies. As far as individual countries with institutional problems, sure, there are ways to help. But can we do it by "fighting injustices", as you suggest? Forcefully? We have a pretty unpredictable track record there, Iraq especially. Now we're talking about arming Syrian rebels, which might do nothing more than kill people faster. Even rebel factions are fighting each other, Iran and Lebanese Hezbollah would like to get into the politics, and there's no evidence that they could put together a peaceful, cooperative government. I know this is a stretch from Bangladesh, but I'm just saying that it's not so easy to just march in and fix other cultures. What I really wish we could get better at is fixing our own problems, stay close to home, and set a good enough example for the world to want to come to us, instead of hating our interventions. When I said "fight injustice" I didn't mean it by force. I meant by gradual cultural changes with proper education and worker freedoms over the years. Of course we won't see the results in our generation, but perhaps we can get it started or contribute enough to even some minor success. I agree we need to first take care of America before we can help others. Both of those points sound reasonable and very agreeable to me. How about focusing closer to home? US President Barack Obama and his Mexican counterpart Enrique Pena Nieto have agreed to boost trade and create jobs on both sides of the border. After talks in Mexico City, Mr Obama said illegal immigration to the US was at a historic low due to the strength of the Mexican economy. He also pledged to continue co-operation in combating drug-trafficking despite a shift in Mexico's policy. Mexico wants to end the widespread access the US has to its intelligence. 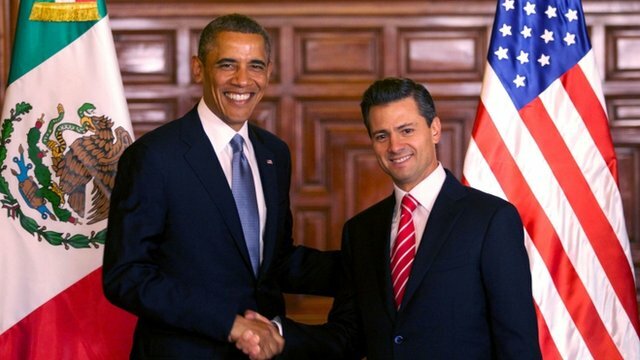 This is Mr Obama's first visit to Mexico since Mr Pena Nieto took office in December 2012. "I agreed to continue our close co-operation on security, even as the nature of that co-operation will evolve," the US leader said at a joint news conference. For his part, President Pena Nieto played down notions that the recent shift meant less co-operation between the two countries. "There is no clash between these two goals." Mexico's Deputy Foreign Minister for North America, Sergio Alcocer, announced on Monday that an arrangement allowing US security agents unprecedented access to Mexican intelligence would come to an end. All requests by the US security agencies would now have to be channelled through Mexico's interior ministry, which controls security and domestic policy. Mr Alcocer insisted the new policy would improve co-operation rather than hamper it, but US analysts said the move could put an end to ties forged between agents on the ground. In Mexico City, Mr Obama also highlighted that an overhaul of the US immigration system was important for US-Mexican trade, which totalled $500bn (£322bn) in 2012. Mexico is the third largest trade partner of the US. 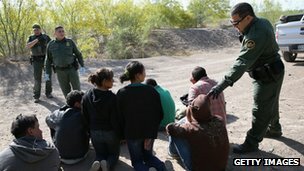 Getting Mexico's backing on securing the 3,200km-long (2,000 miles) border could prove key for President Obama as he tries to sell his immigration reform to US politicians, analysts say. Bipartisan senators currently debating the reform have insisted that tough border security be in place before undocumented immigrants can gain legal status. A strong Mexican economy could also help cut down on emigration from Mexico, as workers do not feel the need to seek employment abroad. Last year, for the first time in four decades, about the same number of Mexican migrants returned home as arrived in the US, bringing net migration to zero, according to the Pew Hispanic Center. The trend has been ascribed to tougher border controls and immigration laws on the one hand, and the US recession and a growing Mexican economy on the other. President Pena Nieto said the two leaders had agreed that the bilateral relationship be multi-themed - an inference that in recent years security concerns have dominated at the expense of economic and trade issues, the BBC's Will Grant in Mexico City reports. Mr Pena Nieto said a deal had been reached to create a joint commission for the economy and bilateral trade, which would include US Vice-President Joe Biden and other senior officials. A working group was also announced to support young entrepreneurs on both sides of the border as well as agreements on university education. To underline the strength of the bilateral relations, Mr Pena Nieto used former US President John F. Kennedy's saying: "While geography has made us neighbours, tradition has made us friends." However, the new tack on security combined with comprehensive immigration reform in the US will provide a strong test of that friendship, our correspondent adds. There's an economic conundrum involved in solving the undocumented alien issue between the United States and Mexico. There is one change which, if it could be done overnight, would cut undocumented Mexicans from crossing the border to near zero, and that is for our economies to be on a par. If Mexico were a prosperous country (which it could be if the government, police, and upper class weren't so f*cking corrupt), Mexicans would come to the United States on vacation instead of in an effort to support their impoverished families. The conundrum is that there is no way to increase trade to help the common Mexican that doesn't take jobs away from Americans. I sometimes wonder if annexing Mexico to be a U.S. territory like Puerto Rico or as the 51st state might be the only solution with any real chance of working. Fifty-six percent (http://latino.foxnews.com/latino/news/2011/03/16/56-puerto-ricos-ch...) of Puerto Rican children live in poverty. What have we done for them? Kept drug cartels out of PR? We could possibly do the same for Mexico. Supermarkets destroyed the livelihood (pdf) (http://www.regoverningmarkets.org/en/filemanager/active?fid=88) of many, many millions of Latin Americans. See this (pdf) (http://www.crawfordfund.org/assets/files/conference/conf2011/superm...) for more details. I'm not much for lengthy reading assignments (I have a life outside TA and would like to follow several threads, not just one). How about an abstract? Supermarkets are one of the major causes of illegal immigration. Millions and millions of Latin Americans are facing starvation, because supermarkets have taken away their only means of survival. What other options do they have?" Is that so that the supermarkets can say they support U.S. agriculture? Now, that's a stretch about America keeping drug cartels out of Puerto Rico. They don't even have the geography to support massive drug production. Meanwhile, our for-profit-only trade with China is nourishing China's own form of growing corruption-at-the-top. It's true that it might be too late to use legitimate, free enterprise as a tool to quickly help motivate Mexico into modern commerce, but we're empowering China to become a monster competitor, driven by corrupt, self-anointed "communist" idealists. Sure, Mexican drug cartels flourish in kahoots with Mexican corruption, but it's still all driven by American $, and guns. I'm just saying, lubricating legitimate commerce with Mexico may be the only way to compete with and quell corruption, besides the fact that they're living right next door. So it's better to just stick with our default economic model, which is to bring China into our job market?